The Fox Metro Water Reclamation District (Fox Metro) came into being in the late 1920’s by the voting of 40,000 area residents concerned with the sanitation and health protection of their community. The original Trickling Filter wastewater treatment plant (WTTP) was built to treat only 8 Million Gallons per Day (MGD) of wastewater. The environmental movement of the 1960’s and 1970’s gave birth to stringent new water quality regulations that resulted in the WTTP undergoing a series of major expansion and upgrading projects. These projects, which included a conversion to the Activated Biosolids wastewater treatment process, were completed in 1982. Although Fox Metro’s service area has seen continued growth since 1982, the WTTP has consistently been able to remove more than 98% of the common pollutants in the raw wastewater it receives. Fox Metro has achieved this success through a series of WTTP plant improvements intended to prepare Fox Metro for the future. 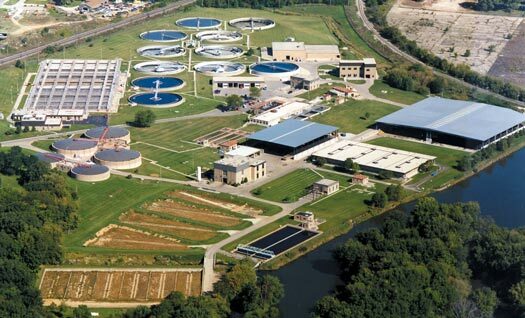 Today, the Fox Metro Wastewater Treatment Plant is an advanced high efficiency facility capable of routinely treating up to 42 MGD of wastewater generated by a population nearing 300,000 living in Aurora, North Aurora, Boulder Hill, Montgomery, Oswego, Sugar Grove and portions of Yorkville and Batavia. The goals of Fox Metro are to economically treat the wastewater generated by the residents, industries, schools, businesses, churches, and other users within its boundaries; and to consistently produce a final effluent that surpasses stringent Federal and State water quality standards and can safely be returned to the Fox River. Fox Metro accomplishes this goal by cooperating with various municipalities in the operation of a collection system and by operating its own WTTP.